When Mother Nature wants to heal a wound, she doesn’t get a bandage. She creates new skin. 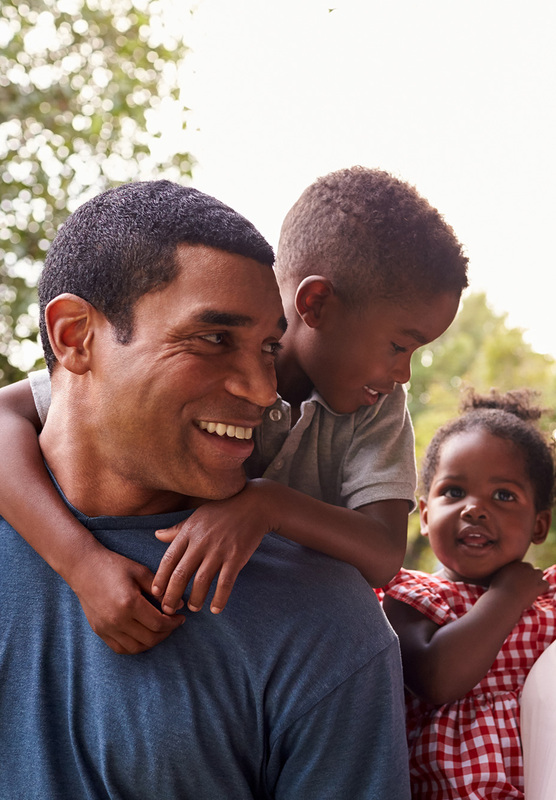 Now, you can do one better, healing and protecting your family with a strong but flexible second skin that, unlike traditional bandages, instantly blocks out air, water, dirt, and debris. Dries quickly, depending on thickness of application, creating a breathable, protective layer that promotes healing. Ideal for hard-to-cover areas such as knuckles, knees, elbows, fingertips, and toes. Requires only one application. Each application lasts 3-5 days, sloughing off as the wound heals. High viscosity formula that won’t run, thicker for controlled applications. Easy to use convenient pipettes make it a breeze to take along on any excursion. Will fit in just about any first aid kit. More Economical than multiple bandage applications. Sold in sets of two individual, 1 gram, multiple use pipettes. Preparation: Wash area thoroughly and make sure it is clean and dry. Do not apply any ointments, creams, or lotions before or after application of the bandage. Application: 1) Remove overcap and gently twist off tip. 2) Topically apply an appropriate amount of LiquidSkin® to the desired area. 3) Setting time will vary by thickness from 30 seconds to several minutes. If placed on an undesirable area, it can easily be wiped off with a tissue. 4) Replace overcap for future use. Removal: Product will slough off naturally as the dermal layer continues to grow. If necessary, it can be removed by applying lotions, ointments, or emollients and peeled off. Storage: Store at room temperature (do not refrigerate). WARNINGS: Do not use in or around the eyes or on burns, wounds or skin with active signs of infection. Avoid placing adhesive into lacerations. Consult your doctor for use in case of a serious wound, burn or animal bite. Make sure the bandage has fully dried before allowing it to come in contact with other objects. KEEP OUT OF REACH OF CHILDREN. CAUTION: Should not use if allergic to cyanoacrylate. Use as directed. The quickest and most convenient bandage isn’t a bandage at all. 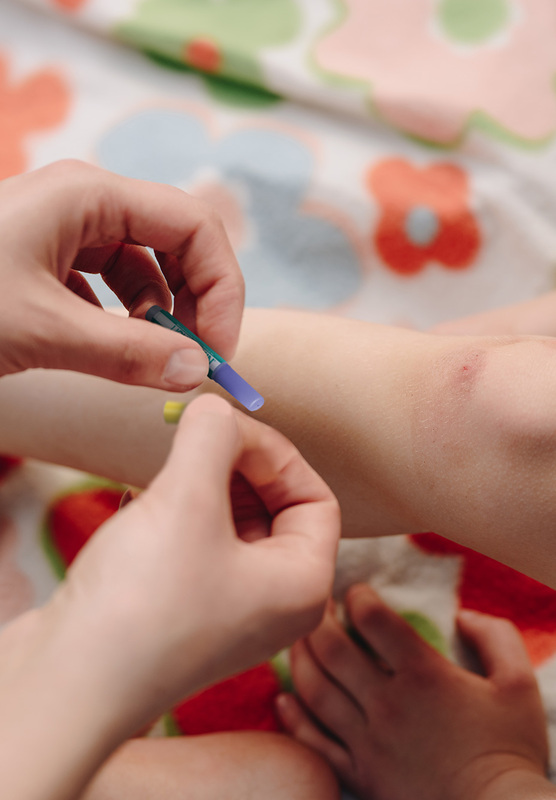 It’s a fun, flexible adhesive that dries in seconds to soothe minor cuts and scrapes—creating a durable seal that stays put longer than regular bandages, especially on moving parts like fingers, knees, elbows, and toes. LiquidSkin® goes on without stinging or irritating. No more finding used, soggy bandages on the floor under your couch or in your kitchen. 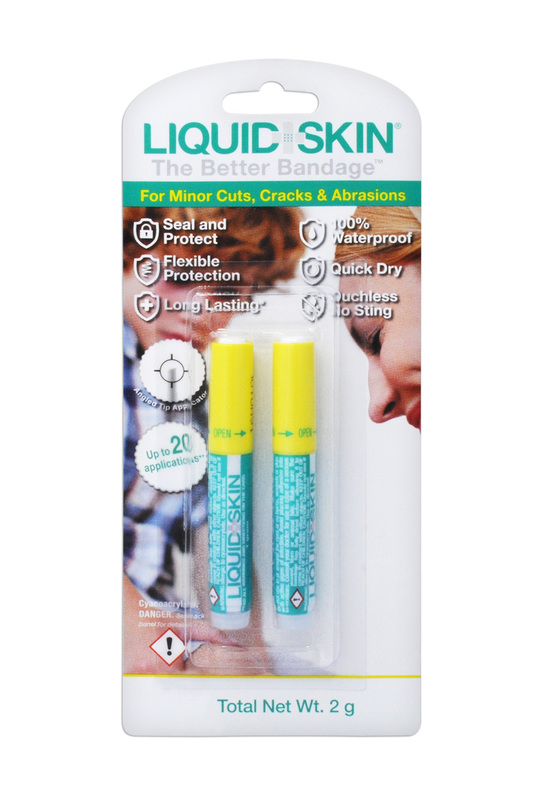 LiquidSkin® lasts for 3 to 5 days per application, sloughing off naturally when it’s no longer needed. And no more digging around in the bottom of your bag for your last crumpled bandage when you need to cover a scraped knee at the playground. 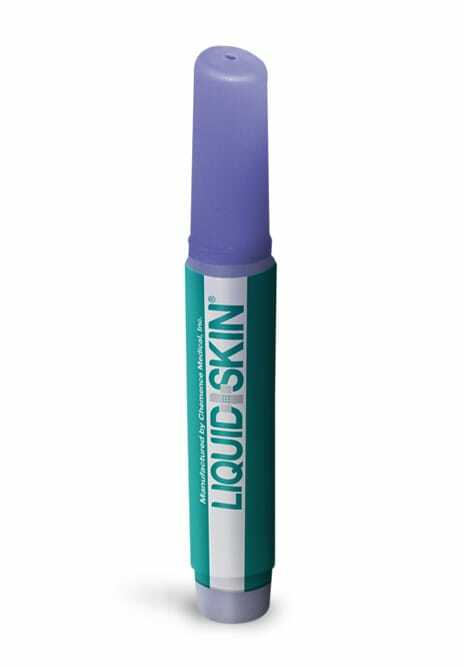 Pop a tube of LiquidSkin® in your bag or glove compartment and you’re good to go. With LiquidSkin®, it’s mom to the rescue.